What: Like To Play Pretend? 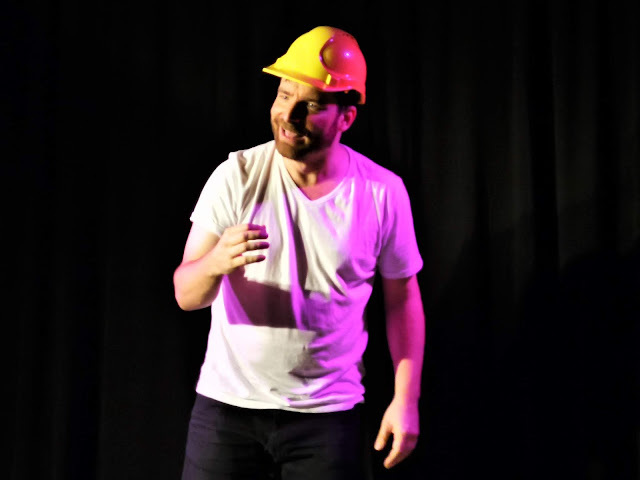 Yes, the Melbourne Comedy Festival has started for 2019 so it is time to strap yourself in for some riotous acts and some not so funny moments. For me the Festival began with a revisit to Willem Richards at the Tickle Pot in Like To Play Pretend? I first came across Richards in last year's Fringe Festival in Willem Richards IRL. He is incredibly likeable and had some very funny sketch ideas but I thought the show was under rehearsed. This year I was excited to have the opportunity to see him full flight. I was disappointed. Richard's style of sketch humour hasn't changed, and his hallmark use of props is the same. He even revisited two of my favourite sketches from the Fringe show - the thai massage sketch and the douche bag hat sketch. This year he has some fantastically strong ideas as well which is exciting. We start the show with Richards inviting us to meditate our stress away. As we close our eyes and relax, we are invited to focus on persons who induce stress - and then a gruesome blood bath unfolds! There are other interesting ideas which have not been fully fleshed out but which have potential such as the club DJ and the morning tea idea, but they still need further development. The weakest moments are when Richards uses voice overs. The recordings aren't clear so I found myself not being able to understand what was said and I feel I missed a lot of jokes. I am not a fan of stand up comedians using voice overs. It rarely works and it messes with the energy. There has to be other ways to do what they are trying to do which isn't so...fake? The greatest disappointment of the evening for me though was that this show feels as under rehearsed as his last show. In IRL I gave Richards the benefit of the doubt. In Like To Play Pretend? I am not feeling so generous. Sometimes the difference between a top class comedian and a bottom of the pack comic is the polish and finesse with which they do their work. Even allowing for opening night jitters Richard's transitions are still clunky and he isn't displaying the confidence needed to make us believe a very funny joke has been made. I don't really know what the title is referring to but I think Richards needs to take his own advice - pretend he is funny and then he will be. The material is strong and original but he needs to sell it.